The Earwig is a common sight throughout North America and gets it creepy name from the false idea that these insects actually crawl into your ear and bite you from the inside. The fact is that these insects are generally afraid of people and are more likely to scurry away if disturbed or threatened. At the very most, the Earwig lightly damages any plants that it may feast on but beyond that, a passerby is safe from those intimidating pincers. Earwigs generally appear as a brown or a black with some possible yellow on the body. The body itself can range between 10mm and 26mm in length and, though some species of Earwigs have wings, they seldom fly. Earwigs are very common in the outdoors, usually around gardens and fields. Stray Earwigs might make their way into your home but that would be about the extend of their infestation. Most likely a "lost" Earwig. 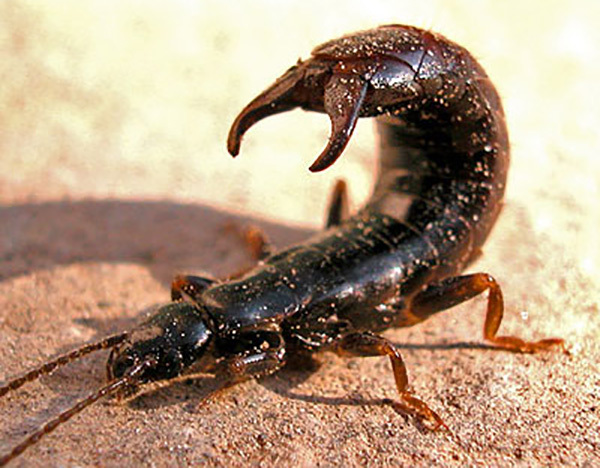 Earwigs enjoy the nighttime hours where they are freer and more safe in hunting other insects. Eggs are laid in the fall in the dirt or loose ground litter and eventually hatch in the spring time. Nymphs will tend to grow faster in the hot summer months in the South, producing more generations per laying than in the cooler North of the United States.